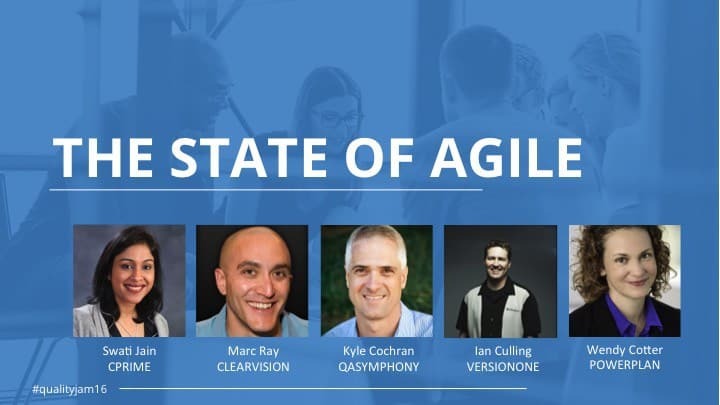 At Quality Jam 2016, I had the opportunity to moderate an excellent panel, The State of Agile, that brought together practitioners and thought leaders for a great discussion on the State of Agile. The panelists were Marc Ray from Clearvision, Swati Jain from CPrime, Wendy Cotter from PowerPlan and Ian Culling from VersionOne. You can watch the entire panel discussion below. Agile is not a silver bullet. It is a framework that offers best practice guidelines for how to drive efficiency and productivity for the team. It’s all about the people. With many agile transformations, the focus is all about the process. That would be a mistake. The true focus to make agile successful in a company should be on the people. Without the right people, the process will not be successful. Don’t confuse the methodology with the technology. Some companies feel that they have to do waterfall because they are on a certain technology. The part that people are missing is that you can still do iterative development even if you are not releasing software every two weeks. Agile increases visibility, for better or for worse. One of the challenges with agile is that you are giving a lot of visibility to people failing. Companies have to be comfortable with failure, as long as you are failing fast. Agile is not just about development. For agile really to work, you need buy-in across the organization, all the way up to the executive team. Agile doesn’t work in a silo.